Now a days everyone follow dual SIM trend this time Motorola introduced its new dual SIM smartphone Moto G Exceptional phone.Exceptional price. 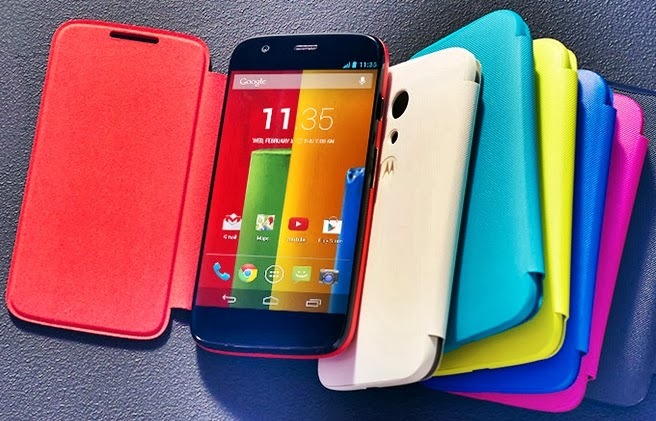 Best features of Moto G you can wirelessly transfer your photos, videos, SIM contacts and even your call and text history from your old Android phone to your new Moto G.
It has same 4.5-inches 720 x 1280 pixels resolution and 326 ppi density with Gorilla Glass 3 screen protection, 1.2 GHz Snapdragon 400 processor, 1 GB RAM, 8 or 16 GB non-expandable storage and Adreno(GPUs) 305, 5 mega-pixel(Back) and 1.3 mega-pixel(Front) HD cameras, Battery capacity 2,070 mAh, Android 4.3, Dual SIM. Audio jack, 3.5 mm, BLUETOOTH, GPS, Micro USB, 2.0 high speed, Wi-Fi, CDMA bands, 2G/2.5G GSM/GPRS/EDGE bands.